This film focuses on the work of researchers from Makerere University, Uganda, in Rakai district, an area of the country whose farmers are particularly prone to climate change-induced water vulnerability. As part of the WATERCAP project, they have helped transform local people’s lives. Through the introduction of low-tech innovations, the farmers now enjoy year-round access to safe water for both farming and domestic use. And the researchers have been able to augment their academic training with knowledge gained from working alongside the farmers in the field. 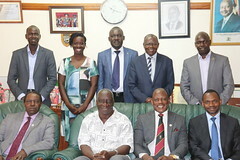 WATERCAP, a collaboration between Makerere University, Egerton University in Kenya and the University of Natural Resources and Life Sciences in Austria, was funded by the Austrian Development Agency. Operating in Kenya and Uganda, it has aimed to increase the capacity of participating universities to contribute to the mitigation of climate change in smallholder agriculture. It was also designed to use the interaction with local communities to improve university curriculum and ensure research is more relevant to farmers’ needs.